For the kind of cycling fanatic that travels with more than one bike, the far western part of the state offers up a perfect convergence of two-wheel of opportunities. 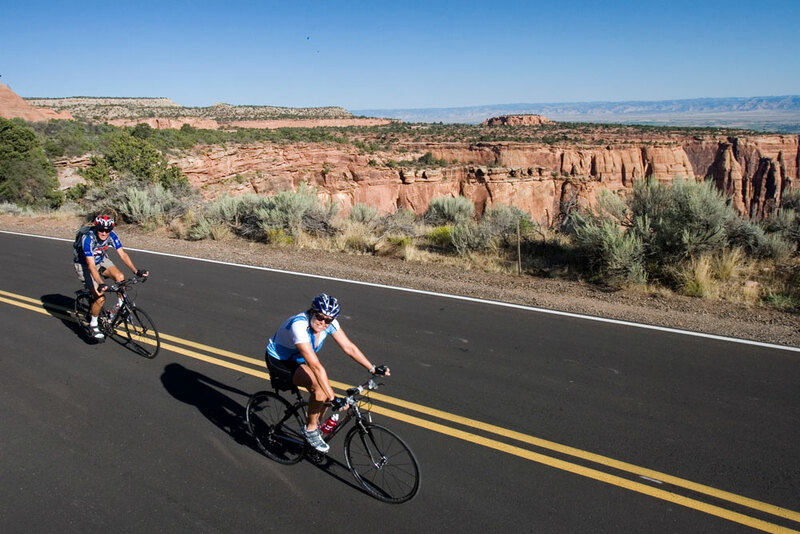 Experience the mountains, high desert, sheer cliffs and plateaus with a Fruita mountain-biking adventure and a road-bike circuit through the Colorado National Monument. This welcoming Western Slope town borders on obsessed when it comes to mountain biking. Known for hundreds of miles of world-class trails and considered by many as the best biking spot in the state, Fruita offers thrilling dusty-trail and slick-rock rides for beginners to pros. If you’re craving a fun intermediate ride, start out on some of the 18 Road trails just north of Fruita. The Chutes and Ladders trail traverses the breathtaking Book Cliffs that shoot up in rectangular slabs from the hard-packed valley floor. Earn your downhill bursts (chutes) with some grueling climbs (ladders). Neighboring Zippity Doo Da is as whimsical as its name, with intense swooping downhills and technical singletrack lines ripping through the desert landscape in an eight-mile loop. Or, for an advanced ride, head five miles west of Fruita to the expert Kokopelli Trail and take on rock obstacles, killer climbs and ridge-hugging turns with huge drop-offs and canyon views. Less intimidating and great for beginners, Mary’s Loop is a tamer section of the Kokopelli trail system, with incredible scenery and bird’s-eye views of the Colorado River. 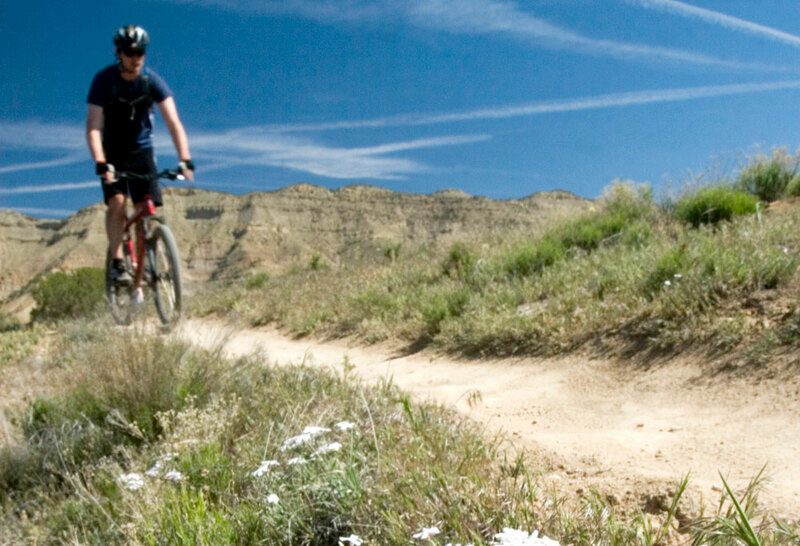 For more information on mountain biking in Fruita, visit gofruita.com. Nicknamed "Tour of the Moon" by road-bikers who traversed its undulating and other-worldly circuit in the famous 1980s Coors Classic bike races, the monument shares the same wondrous natural phenomenon status as the Grand Canyon and Utah’s Arches National Park. Rock plateaus and steep canyons make it a popular climbing, biking and hiking destination. To get there, drive three miles south of Fruita on Hwy. 340 to the west entrance. Stop by the visitor center (four miles up from the entrance) and learn about the 32-square-mile monument’s history and geology. Spend the day pedaling paved Rim Rock Drive. Be sure to pack lots of water for this 23-mile journey through the semi-desert climate and keep your eyes peeled for bighorn sheep, coyotes, eight types of lizards, golden eagles and other natives. Gauge your level of fitness and ambition for the day and choose how far you’d like to go. If you decide to ride the entire circuit, keep in mind the route joins with connecting roads for a grand 33-mile loop. Bike single-file and switch on required bike lights through tunnels along this high-traffic roadway. Take in the rugged solitude as you travel alongside time-carved rock layers that are nearly 2 billion years old. The challenging route invites low gears and patient climbing with lots of breaks for photo ops. Catch your breath at scenic overlooks such as Artists Point and Devils Kitchen, and don’t miss the stunning purple-gray Book Cliffs and vast flat-topped Grand Mesa. Read Fat Biking in Colorado, 6 Ways Colorado Biking is Best and Colorado Mountain Biking Trails for Every Level.